You are thinking about becoming vegetarian. Cool stuff! This article discusses all the important aspects that are involved when making the decision – including tons of practical cooking tips and tasty recipes. I also convinced my friend and nutritionist Claire Garcia Ruiz BSc MSc to contribute to all the health related parts, making sure everything you read is footed on reputable and up to date science. Going vegetarian is a big lifestyle change and without a clear motivation it will be difficult to go through with it for long. It’s the same as with everything else: if you don’t see the purpose in what you are doing, you will eventually stop doing it, because you feel it’s not important, or boring, or annoying. Let’s have a look at the main three arguments: health, environment and animal welfare. Health: First of all I have to disappoint you. It is difficult to argue that a well executed vegetarian diet is healthier than a well executed diet including meat (more on that later). Of course there are many people who have never felt better on a vegetarian or vegan diet. 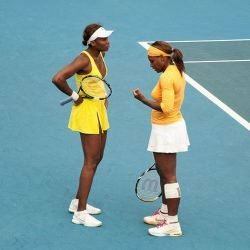 There are even more and more athletes going down that route: for example the tennis stars Venus and Serena Williams are on a vegan diet; Patrick Baboumian is a successful vegan strongman athlete; or the professional runner Michael Arnstein actually lives just on a raw fruit and vegetables, while Novak Djokovic refrains from all dairy products. Scott Jurek, one of the most successful ultrarunners in the world, is completely vegan, and he shares his story in this amazing book. Patrick Lange, the current IRONMAN World Champion is also vegetarian. Personally, that left me stunned when I realized what impact eating a lot of meat has on our planet. Animal welfare: Many vegetarians would probably keep eating meat if it wasn’t for the way how animals are treated in factory farms and slaughterhouses. Pigs, cows and countless others have lost their status as living beings and are reduced to a commodity that is fiercely “optimized”. Most of us have seen videos and photos of the unbearable conditions in which livestock is growing up and being slaughtered. Even most people who eat meat have trouble supporting factory farms. The result is they stay in denial. Forks Over Knives – a documentary on the health benefits of a vegetarian and vegan diet. Cowspiracy – The Sustainability Secret – a documentary mainly on the environmental issues of factory farming. Animal rights activist Gary Yourofsky – one of the most impactful speeches on eating animals. 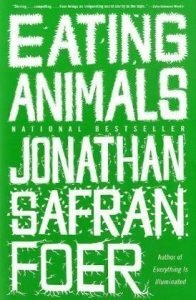 Eating Animals by Jonathan Safran Foer – a very thoughtful and compelling book in which the author is not trying to push his opinion upon the reader. Please take every source with a grain of salt, do some more research and then form your own opinion. Ok, you’re sure you want to go vegetarian. What will happen with your health? A vegetarian diet can meet all nutritional requirements throughout the lifecycle. A vegetarian diet can have higher levels of antioxidants, fibre, folate and phytochemicals. A vegetarian diet can have lower levels of saturated fat and a better balance of dietary fats in general. All sounds good, but why do I emphasise so much on “can”? Because it’s easy to eat vegetarian in a completely unhealthy way. Which nutrients need more attention in a vegetarian diet? We need protein in our diet for growth, repair and normal function of the body. If you like digging into science, proteins are responsible for all sorts of amazing processes including carrying vital substances around the body. For example, you may have heard of haemoglobin but not known that is a metallo-protein that carries oxygen in the blood. Hormones like insulin (which regulates blood sugar in the body) are also proteins – pretty awesome stuff. The good news for vegetarians is that meat eaters typically get more protein than they actually need. So meeting protein requirements shouldn’t present any issues for vegetarians but there are a few factors that you should be aware of. Historically vegetarians were told to “combine” different sources of proteins at meal times to ensure the full range of amino acids were being met. Protein is an umbrella term used to cover all the different amino acids. Meats contain a full complement of all the amino acids but most plants sources do not (quinoa is a notable exception to this general rule) . Amino acids fall into three categories; “essential” meaning that as humans we cannot make them ourselves; “non-essential” meaning that we can use nitrogen and carbon to make these proteins and “conditionally essential” meaning that under certain conditions our body’s needs may outstrip its ability to make them. The historical advice to “combine” protein was based on two factors. Firstly that plant sources of protein do not contain the complete range of amino acids. The second factor was a belief that the body can’t store any amino acids for future use. We now know that the body has some ability to access amino acids from an “amino acid pool.” This is made up of amino acids from dietary sources, from our own tissues and from protein turnover in the body. What this means in real terms is that vegetarians should aim to be eating a variety of sources of protein but that they don’t necessarily need to combine them in the same meal. 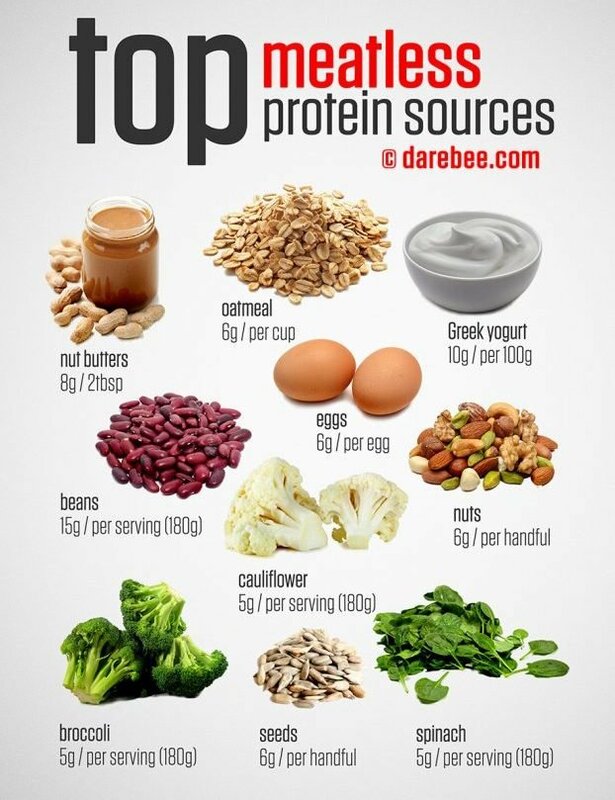 While we are on the subject of protein, if you eat eggs and dairy products then these are sources of complete sources of protein in your diet. When we talk about incomplete proteins, two of the amino acids of particular concern are lysine and methionine. Wheat and rice proteins are comparatively low in lysine but better sources of methionine BUT beans and peas are relatively high in lysine yet in lower methionine. On this basis, I used to recommend that vegetarians mix these sources at meal times. It’s still good practice to mix these but you don’t have to. Following the buddha bowl mantra of a “grain, a green and a bean” will certainly stand you in good stead. Key message: A varied vegetarian diet can provide all the protein you need. Omega 3 fatty acids belong to the polyunsaturated fats family of which we mainly talk about Omega 3 and Omega 6. Omega 3 and Omega 6 fats both play important functional roles in the body but there’s a good reason why we talk more about Omega 3 than we do about Omega 6. This is due to the fact that the typical Western diet is too high in Omega 6 relative to Omega 3. It’s not entirely clear what the optimum ratio is, but we definitely need to be focusing on increasing our intakes of Omega 3 and being mindful of not over consuming Omega 6. Omega 6 fats have a cholesterol lowering effect but consuming more is not better because they lower both HDL (“good cholesterol”) and LDL cholesterol (“bad” cholesterol”). Omega 3 fats have different actions to Omega 6. They don’t have any marked effect on cholesterol levels but they do have important anti-inflammatory and anti-thrombotic effects (reducing the risk of blood clotting). Their anti-inflammatory processes may be particularly important if you have an inflammatory condition such as arthritis or eczema. Omega 3 fats are also important for brain function and a healthy nervous system. If you grew up being told that “eating fish will make you smarter” this is where that saying comes from. Knowing that oily fish is a great source of Omega 3 doesn’t really help you out as a new vegetarian. But don’t worry, there are lots of good sources of Omega 3 within the plant kingdom too. Key message: Ratios matter. You may need to be mindful of Omega 6 intakes and increase Omega 3 to get the balance right. Eggs are often fortified with Omega 3. This is achieved by giving hens diets that are rich in Omega 3. Important functions of vitamin B12 include the production of our red blood cells, maintaining a healthy nervous system and assisting with the release of energy from food. Most foods in the animal kingdom contain vitamin B12. The good news for vegetarians (as opposed to vegans) is that dairy products and eggs are sources of B12. Also, many foods are fortified with B12. Examples of these include breakfast cereals, yeast extracts and non-dairy alternatives such as soy, almond and rice milks. Do be careful to check the labels though as not all products in these categories are necessarily fortified with B12. Key message: Vegans need to have a closer look at vitamin B12 and even consider taking a vitamin B12 supplement. If you eat eggs and dairy you are on the safe side. Iron is needed to carry oxygen around the blood and muscle tissues. Iron is also needed to help chemical reactions take place in the body. Included in this are reactions involved in the cellular production of energy. So it’s easy to see why you would feel pretty rubbish if you were not getting enough of this very important mineral in your diet. Here’s a fact that a lot of people in the general population don’t know: in Western societies we get more of our iron from cereal products than we do from meat products. This is due to the fortification of cereals with iron. So a vegetarian diet doesn’t need to cause any problems when it comes to iron intake. HOWEVER, poorly managed vegetarian diets can put you at risk of iron deficiency. The issue with iron in vegetarian foods versus meats/meat products is due to the relative ease with which we can absorb the iron in the food. Iron from meat (haem iron) is much more readily absorbed than iron from vegetarian sources (non-haem iron). 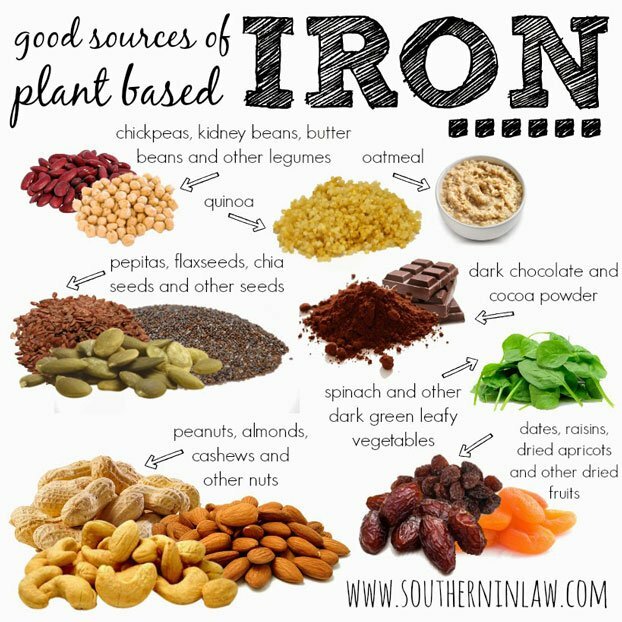 Sources of iron in a vegetarian diet include fortified cereals and breads, green leafy vegetables, nuts, dried fruits, tofu, lentils, beans and pulses. Naturally occurring compounds in these foods such as phytates reduce iron absorption. Tannins in tea have a similar effect (so drinking black tea at meal times isn’t a great idea). You can increase the amount of iron that is absorbed from food by also having a source of vitamin C with your meal. We typically think of fruit when we think of vitamin C, but we also get vitamin C from vegetables. Green vegetables such as broccoli, kale and cabbage all have vitamin C but remember that vitamin C gets lost in relation to the method of cooking (we’ll talk more about that later). Key message: Vegetarians need to eat enough nutrition dense foods in order to get the amount of iron they need. Hooray! You made it through the toughest part. Now you have a broad overview on how to stay healthy while becoming vegetarian. Still, I’m sure the following question is on your mind too! Is a vegetarian diet healthier than a diet including meat? You might have heard of the highly popular Paleo Diet? It’s basically a low carb diet (including meat) that tries to be as close to natural ingredients as possible. You’ll find many scientists and athletes advocating that diet and back up their arguments with studies. On the other side you’ll find many scientists and athletes advocating that a vegetarian or vegan diet is the perfect way to make your body thrive. Of course they also have many studies and success stories to make their point. Interested in reading up on these diet battles? For pro vegetarian click here and contra paleo click here. For pro paleo click here and contra vegetarian click here. If you are worried that all those sources are not authoritative enough check out this article from the Harvard Medical School on the Paleo diet and here is another Harvard article on the vegetarian diet. My personal opinion: many scientists and “health experts” have built businesses around those diets and therefore have a monetary interest in convincing people of their beliefs and finally sell their service or product. That makes it difficult for you to find an unbiased point of view. The gist is in order to eat vegetarian in a healthy way you need to focus on whole foods and cut out as much as possible of the bad stuff mentioned earlier (high sugar content foods and drinks, processed food, unhealthy oils, etc.). But the same holds true for someone who eats meat. You’ll definitely be healthier than anybody who eats a lot of processed food, sugar and salt – with or without meat. But whether you feel better on healthy vegetarian diet or on a healthy diet including the occasional piece of meat, is something you have to find out individually (fortunately something the Harvard Medical School agrees on with me). I assume the differences will be marginal, but maybe you’ll notice something. There is no universal answer to this question because everybody is different. How to make a gradual switch to a vegetarian diet? 1. Try one or two new recipes a week. I’d argue that you need around 5 to 10 of easy, filling and delicious recipes up your sleeve to make a successful switch to going vegetarian. We are creatures of habit and most of us end up making the same stuff over and over again. In the recipe section below I picked our best recipes to get you going! 2. Tool up and learn some kitchen skills. This one was especially important for me. Switching to a healthy vegetarian diet usually means standing more often in the kitchen. My skills were very limited, but with a good knife and some tips on how to cut stuff (see here and here) I got good pretty quickly. If you’re a kitchen newbie, don’t let a bad knife and your cooking skills get in the way! 3. Substitute meat with vegetarian ingredients. I’m sure you already have some recipes you frequently make. Maybe a chili, fajitas, burgers or a curry. Pretty much any meal can be made vegetarian nowadays. You could try textured meat substitutes. They are usually made out of wheat or tofu and can taste pretty awesome. Or, if you prefer to eat less processed food, go for legumes. You won’t believe how versatile lentils, chickpeas, beans and the like are! I’ve added a couple of ideas to “vegetarianize” some popular dishes in the recipe section below. 4. Exclude meat, poultry and fish one step at a time. Going vegetarian doesn’t have to happen over night. Start by replacing meat from animals with four legs (pork, beef). A couple of weeks later do the same with poultry and eventually replace fish with vegetarian ingredients. That gives you enough time to come up with new recipes and avoid the pitfalls mentioned earlier. 5. Keep dairy and eggs in your diet (for now). Going vegan is definitely not easy, although it’s certainly something to aspire to. You need to learn many new recipes and focus more on getting all the nutrition you need. Keeping eggs and dairy in your diet will be easier for you to meet your protein, vitamin B12 and other nutritious needs for the time-being. Some of us are not all that much into following recipe directions and sometimes it doesn’t even make sense because we just don’t have the necessary ingredients at home anyway. Here are four “How Tos” that help you to eat delicious vegetarian meals with what you have at hand. How to Make Overnight Oats in a Jar – a great way to have breakfast! 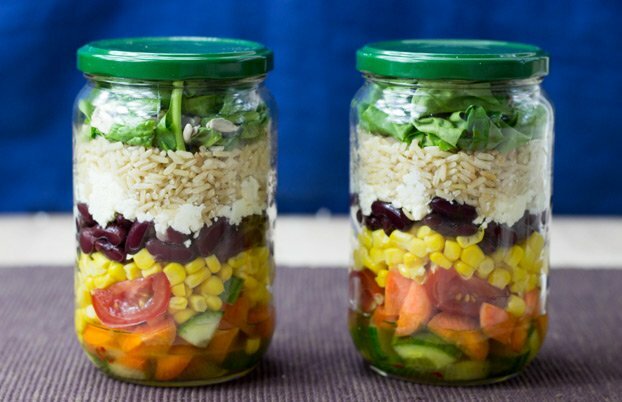 How to Prep a Salad in a Jar – quick and easy way to have lunch at work. How to Roast Vegetables – The Awesome Way – let the oven do all the work for you! How to Make Buddha Bowls – nutritious, filling, easy and delicious if you follow our tips. Remember I mentioned you need 5 to 10 basic recipes to successfully eat vegetarian? 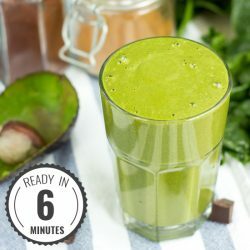 The ones below are easy to make, satisfying, healthy and will take you between 7 and 30 minutes from start to finish. 1. Banana Egg Pancakes – One of my most favourite recipes. 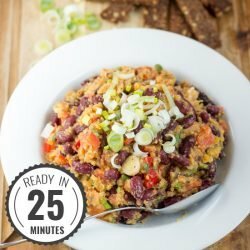 Quick, tasty AF and healthy. 2. Breakfast Egg Muffins – Easy to put together, really delish and high in proteins. 3. 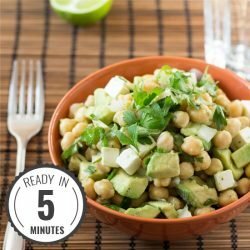 Chickpea Spinach Salad – Probably my favourite salad of all time. 4. Arugula Lentil Salad – This one even works as lunch or dinner. It’s also a constant BBQ hit! 5. Turkish Lentil Salad – Quick to make, super nutritious and a dressing that’s great to have up your sleeve (just not on it, of course). 6. Pear Walnut Salad – Excellent side dish that has it all: fruity, savoury, tangy and crunchy! 7. Greek Pitas – When I started out as a vegetarian I had these probably 3 times a week for 3 months straight, no joke. 8. Baked Sweet Potatoes with Greek Salad – I think you NEED to add baked sweet potatoes to your diet. They are just too good. 9. Fiery Dragon Noodles – This one is a basic recipe everybody should know. Excellent for using up leftover veggies and always turns out great. 10. Spicy Black Bean Soup – Another basic recipe you can start many soup variations on. Highly recommended (not just by me). Chili con Carne but without the meat – mince in a chili is far less important than you think, promise. Easy Green Thai Curry – Crunchy nuts and snap peas will make up for poultry. Also, the liquid is so good that it totally shifts the focus. Enjoy! Black Bean and Rice Burritos – Same here, I bet you won’t miss the mince! On that note thanks to Sophia for the awesome recipe. Easy Veggie Burgers – Burger patties can be vegetarian without being highly processed. Give these from Minimalist Baker a try. How to announce going vegetarian? Diet decisions are always loaded with lots of emotion. At home grandma will be disappointed when you stop eating her delicious chicken soup. Dad will cry when you turn down the BBQ burger. Thanksgiving and Christmas are also tricky occasions. You could run away from everybody and just start a new life, but first you should probably try to have a fair discussion with your nearest and dearest, as there’s a chance they will also be affected by your decision. 1. Don’t switch into attacking mode: You will not win over anybody by making them feel bad. As rational as your arguments might be, an offended human being will not resonate with them. 2. Don’t think your morals are superior. Coming to the conclusion not to eat animals is based on many values you have. Those values are allowed to be questioned. 3. Point out a couple of things nobody can disagree with: Everybody will agree that factory farms are horrible and significantly harm the environment. By saying you want to do your part to change the way animals are treated, it will be hard to step on anybody’s toes. 4. Listen to your gut: If you feel going vegetarian is right, than everybody else will have to accept it. I have been eating about 99% vegetarian since mid 2013. About once a month I’m ok with joining in with a bbq of a friend or accepting a dinner invitation where meat is served. Making the transition to vegetarianism at home was fairly easy. I had one “relapse” right at the beginning because I was completely unprepared. I just cut out meat and didn’t add any nutritious veggie food. My meals were unsatisfying, I felt powerless and ultimately ended up eating meat again, just because I didn’t know what else to eat. The second time I tooled up with a couple of new vegetarian recipes rich in protein and carbohydrates and et voilá my first steps to go vegetarian were done. Along the way I read up on nutrition to make sure I wasn’t harming my body and learned another couple of recipes. My fast food addiction was easy to shift: from salami pizza I went to spinach pizza, from hamburger to veggie burger and from döner kebab to halloumi or falafel kebab, easy. Discussions about me becoming vegetarian were very light hearted. My mom supported me right away and offered to make veggie options for Christmas for example. Similar with my father. He was a small farmer and despises the developments in factory farming. You’ll hear the “where do you get your protein” question every now and then, but once you list up a couple of ingredients they are satisfied. Things can get heated once you start persuading people of your views though! It’s completely fine to defend your point of view, but sometimes you’ll find it easier to convince people with delicious recipes. It’s a classic snowball effect that touches everybody you’re in contact with, I promise. You won’t believe what an impact you can make. All in all I feel very healthy, fresh and vital on a vegetarian diet. I have to point out that it wasn’t different when I ate meat though. I go running, play football a lot, lift weights and never feel that I am outperformed due to diet reasons. It’s about losing the fear for cooking and getting 5-10 awesome veggie recipes up your sleeve. Give it a try, it’s as easy as that! Where can you get even more veggie info? Glad you asked! 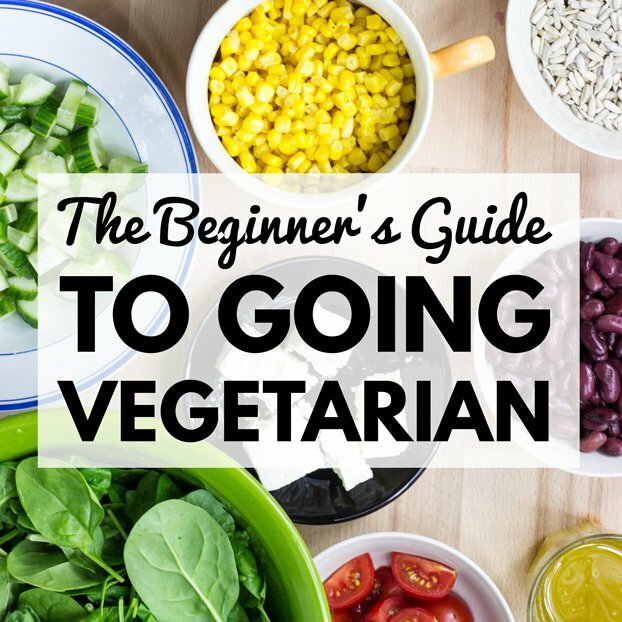 The other day I wrote the piece 60+ Resources to Get You Started on a Vegetarian Diet. It includes many sources on vegetarian nutrition, sports on a vegetarian diet and many many great blogs dedicated to the vegetarian and vegan lifestyle. 1. For some more recipe inspiration check out the food blog Cookie and Kate. She has been around the block for quite a while already and her recipes are down to earth and delicious! 2. For finding vegetarian restaurants visit Happy Cow. It’s an extensive register of veggie restaurants around the world. I’m sure you’ll find loads of options around your area too! (Except you live in Greenland or something). 3. For finding peers join our Veggie Tribe on Facebook! Exchange recipe ideas, ask away any questions that pop into your head and feel free to join our current discussions. 4. Join our 30 Day Veggie Challenge – the most fun way to go vegetarian! Howie–Thanks for this well-detailed info. Pinned and Shared on FB! What a great resource. I love that you aren’t perpetuating the myth that proteins need to be combined. I hear it all too often from many sources and it just isn’t right. Great post! There are pros and cons for any diet and there are also healthy and unhealthy ways to be on almost any diet. Everyone has to do what’s right for them, but I can vouch for a plant based diet being easy, healthy and delicious!! Thanks Jenn! Yes, I totally agree with you on that. It’s all about eating healthy ingredients – then you can get away with almost any kind of diet healthwise. I’ve been vegan for 2 and 1/2 years and I’ve never felt better. I don’t miss dairy cheese because there are so many delicious vegan options that are better for me. Bonus! This is a great resource with lots of good ideas and tips. Thank you! Thanks Linda!! Really great to hear that you enjoy the vegan diet! Yes, also here in Germany there are so many vegan cheese alternative popping up, it’s awesome! The other day I was on a BBQ and there was only 1 (!!) sizzler on the grill, the rest veggie stuff 😀 – we’re getting there. This is one of the best and most comprehensive guides I’ve seen! I totally agree with your slow step by step process. It’s way too hard to cut cold turkey. It took me a whole month to prepare and learn for our diet change, and I attribute our success to that. I’ll be sharing this on all my social accounts!! Thanks for all your hard work in putting it together. Thanks so much for the props Sophia! Yes, it takes always longer than I think putting guides like this together. So cool you are making this step Ivi! Keep dairy and eggs in your diet (for now). „Going vegan is definitely not easy….“ …??? I love this article! I actually just started it will be 1-1/2 week for me that I started my vegetarian journey. And I feel great! I first started with no eating meat which will almost be 2 months but as I read more about animal slaughter ( chicken) I decided to start eliminating chicken as well. & brothers am sure will have alot to say when they find out. I can’t wait for all the criticism that I will hear. Not looking forward to it at all to be honest. Today as I picked up my son from after school program, the leader for YMCA mentioned that she went vegan and it has been 3 months for her. As I told her that am starting she congratulated me and said if I needed support that I can talk to her I felt really great to hear that! That’s awesome, Tanya! And I’m really glad you found the article so useful. Yes, going veggie is definitely a journey, and little steps and adjustments work best, in my experience. Do you have any advice for people who cannot digests beans? I added a recipe with lentils or beans once a day this week and I feel like I’ve swallowed a sack of sand. Can’t sleep, nausea, headaches, bloating, heartburn. I cooked them to death, took digestive enzymes and Beano but can’t seem to tolerate them. Hey Pluto! Oh dear!! That sounds really bad I have to say. Honestly, I find it quite tough to dive around legumes as a vegetarian. Are you ok with “lighter beans” like peas, green beans or hummous? That would already be a good start. Otherwise, work tofu products for you? Maybe adding in a little of that would work. It’s beans as well though… And last but not least you could up your dairy and egg intake a little to even out your protein intake. Oh, do you have the same problem with lentils? if you can digest them, you have an excellent bean repleacement actually.